IT SEEMS ridiculous to write it, but this month marks the second anniversary of a “film studio delivery group” being set up by the Scottish Government. Not many people are sure what this little band of bureaucrats has achieved in the intervening 24 months, as its work has been pretty much shrouded in secrecy. Just about the only element of certainty – after much campaigning, lobbying and exasperation from those at the sharp end of the industry – is that the long-awaited studio is still not off the starting blocks. There has been surely been more written about the almost-mythical scheme than any other cultural project over the past two years – no mean feat when both the Hydro and the Kelpies have been completed in that time. But is Scotland any closer to getting the kind of facility like those where Game of Thrones and Doctor Who are made in Belfast and Cardiff respectively? The picture is certainly a lot more confusing now than it was back in 2013. When the group was instigated by culture secretary Fiona Hyslop, there was only one serious film studio proposal on the table, for Pacific Quay in Glasgow. Film City Glasgow, an existing hub for producers in the old Govan Town Hall, already had a pledge of £1 million from arts agency Creative Scotland. But despite going on to examine sites and options across the country, just one inconclusive report has emerged from the work of this group. That dossier, which found there was a “clear and present opportunity” for a studio, has been bizarrely overtaken by events since it was published last March, with not one but three alternatives emerging to the Glasgow project – which still appears to be the one with most industry backing. Out of nowhere have come two privately funded schemes in Midlothian and Dundee, with the former reaching the crucial stage last week of lodging a planning application. By a remarkable coincidence, the Dundee consortium has just announced it is also pressing ahead with plans first revealed in January. Both schemes are effectively in competition with the prospect of a publicly funded project in Cumbernauld, where filming of the second season of American TV show Outlander recommenced a few days ago. 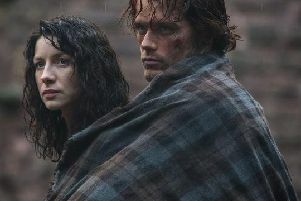 The Wardpark Industrial Estate, where an empty warehouse has been turned into Outlander’s temporary studio, is still the favourite to win official backing from Ms Hyslop, who travelled to Hollywood last month in a bid to secure a studio deal. It is not going to be easy finding a viable solution to a situation that has grown more complex with every passing month but prolonging the procrastination is simply not good enough. Some form of leadership is needed to break the current impasse.